Wineries are Engineering New Wines for You-Guessed-It! I just finished reading a report on millennials and wine in Market Watch magazine, a beverage trade journal published by the Wine Spectator people. The rather exhaustive article (I was exhausted reading it) tried to sum up the buying trends of a population now aged 23-38 that'll peak at 73 million. It's like herding cats. 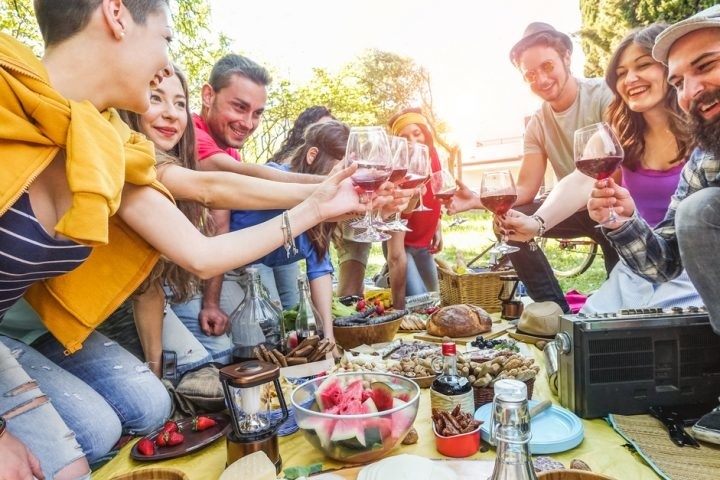 Millennials buy wines in the $12-$15 range. They look for wines that over-deliver. Millennials became the largest generation in the U.S. workforce in 2016. Millennials have taken rosé wine to new heights. They like to have fun with interactive wines like 19 Crimes from Australia and Bota Box wine from the San Joaquin Valley. It's all about the apps. YouTube channels are a good source of information. E & J Gallo has commissioned research into millenneal behaviors in the on-premise (bars and restaurants) and off-premise (retail wine stores) categories. A Gallo spokeswoman said, "Before approaching millennial consumers, we must understand that there are many subsets of this generation, each with its own needs," to which I say, "Duh." Gallo's conclusions are that "by offering wines that are enjoyable and approachable, the (wine) industry will continue its expansion into everyday occasions." Gallo makes Apothic, currently the largest wine brand in the above-$10 segment, offering Red, White, Dark, Crush and Rosé. It reminds me of another super-popular wine, Stella Rosa, also profiled in the article. Stella Rosa started out life as a frothy northern Italian blend of Moscato d'Asti and a sweet red wine, possibly Brachetto. From an initial release that also included a respectable Moscato d'Asti, Stella Rosa found a bigger bulk wine source and amped up its production to make Stella Red, Stella Black, Stella Platinum, Stella Peach, Stella Berry and so on. Each iteration of both company's wines proved the point in winemaking that the larger the production, the more boring the wine becomes, especially when it is engineered, rather than grown on a particular plot of land, imparting the individual, natural flavor of that place. Engineered wine is not new. In some sense all wine is "engineered," that is, fermented, aged, perhaps filtered, perhaps oaked, perhaps blended, then bottled. When engineering becomes objectionable, wine is manipulated for the broadest, least offensive market by adding things to make it appeal to a wide segment of the population. Usually, in America, that means sweetened. I know, I know, I'm getting a little snotty here. I actually know a lovely couple who rarely shop in our store because they love Meiomi Pinot Noir and they can buy it cheaply wherever they may be. It's just that if history has taught us anything, the quickest way to oblivion is to sell your brand to a publicly traded corporation. Remember Paul Masson, Inglenook, Christian Brothers, Almaden? When was the last time anybody said anything about Robert Mondavi wines since the family was forced out? And fake wine will make you sick of it after awhile. I keep remembering the Gallo marketer's quote, "Wine should be more about pleasure than being an expert." True enough. Fair point. Now go drink your Apothic Crush and leave us alone. I've been around for awhile, and though I haven't seen it all, I've seen a lot. For example, I remember when a wine that hit 14% alcohol would kill its yeast in the vat. I remember when Germany's and Oregon's climates would only let them have good wine harvests about three times a decade. I remember when French wine judges couldn't tell the difference between California and French wine. I remember when Charles Krug Chenin Blanc was the best selling premium wine in the U.S. I remember when Sutter Home White Zinfandel was actually made from quality Zinfandel grown in Amador County. And I remember marketers hawking sweet wines--Boone's Farm, Apple Annie, Blue Nun, Black Tower, California Coolers, Mateus, Lancers--to Baby Boomers, getting them to feel all grown up and sophisticated, just like they do to millennials today. Even though if any of us--Boomers or Millennials--drank that stuff we were far from sophisticated. The point here is that there are a few constants in the world of alcoholic beverages. One is that the new generation wants to drink something cool their fathers don't have a clue about. Another is that sweet wines usually are the gateway to more sweet wines which may or may not lead consumers to dry out their tastes. Wine is about prestige in America, even though the old Italian immigrants viewed wine a lot differently. And except for the smart phone thing, and the fact that millennials don't have as much disposable income because of student loan debt and impossibly high rent, they pretty much want what everyone wants--a good glass of wine at a reasonable price. Whenever the craziness of modern product development becomes too out there, I want to simplify, returning to the classics, while they still exist. And many of them are still surprisingly affordable. Because if a Fortune 500 corporation gets its hands on the Port trade, or Rioja, or Chablis or Chianti Classico, it'll be marketing to the kids of millennials, with names like Tawny Black, Rioja Crush, Chianti Platinum, or Pink Chablis. Wait. That's already been done.